Our MEMO Newsletter comes out quarterly, with all the latest stories from our teams in the region, updates on new projects and ideas on how to pray for our work and the Middle East. View and download current and previous editions below. To sign up to our mailing list or to order physical copies, fill in the form here. 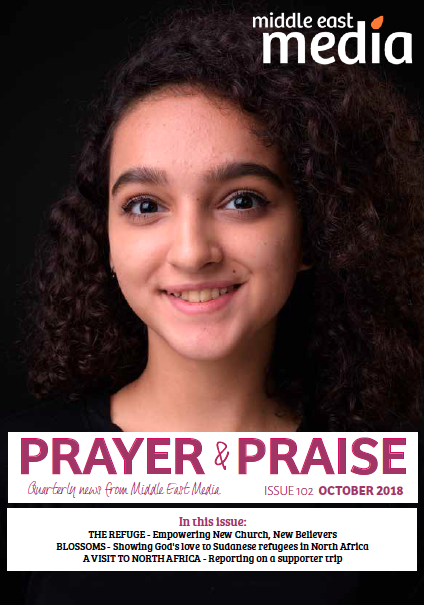 We have just recently changed the name of our newsletter from Prayer & Praise to MEMO. We hope that you will enjoy your new MEMO about all the work that MEM is doing across the Middle East and North Africa. In this issue we share some of the incredible numbers from our work in 2018, our projects for 2019, how your generous support over Christmas will help traumatised children find restoration and healing, and we focus our prayers on background Muslim believers (BMB’s). Click here to download the PDF, or read below. Read about our exciting new project The Refuge, helping new believers in the Gulf to start their discipleship journey in safety. We also hear about how we’re helping Sudanese refugees in North Africa. In this issue we look at how our media was used at the World Cup this year to reach Muslims from the Middle East. We also look at how we’re helping traumatised children in Iraq. 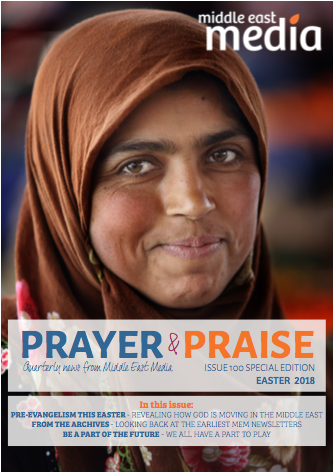 We look back at the archives over the past 100 editions of P&P, we discover how pre-evangelism works in the Middle East, and we talk about how you can be a part of the future. Take a look back at our highlights of 2017, read letters from new believers in the Gulf, and find our full project list for 2018. An update on Basma's powerful testimony, a closer look at our recent Future Leaders media training course, and as always, all our latest prayer requests from the Middle East. Read about how we're challenging the culture of forced early marriage, catch up on news from the Gulf, find out what our supporters say about us, and more! The 'Powerful Poetry' issue - find out how we're using traditional Arabic poetry to speak to a Gulf audience about Jesus in a new short film series called On Bended Knee. You'll also read about how we're using our 3D animated series, Life in the Desert, as a starting point for trauma recovery workshops with Syrian children. Take a look at an infographic of our highlights from 2016, read about our recent therapy course for Syrian refugee women, and see a full list of all our projects for 2017. Plus, learn about the new focus of our Gulf ministry and download your inspirational desktop wallpapers here! Read a sample script from our new TV series for Muslim-background believers, see the beautiful illustrations for our new comic-style bible animations, and more. Meet the participants of our Future Leaders discipleship & media training course, read about our new project for refugees, as well as prayer requests from the Gulf and more. Includes a testimony from an Omani Muslim-background believer, a feature on our new 3D animation, Life in the Desert, as well as an urgent prayer request from Nelly, our International Director. Read the highlights of 2015, and see how the money we raised from our 40th anniversary event is making a difference in the Middle East!